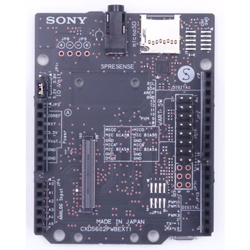 SONY’s SPRESENSE is a low-power board computer for the IoT that is furnished with a GPS receiver and supports high-resolution audio codecs. The board is available now from RS Components. The board provides for IoT versatility and can be developed for a wide range of uses, such as a drone using the GPS and a high-performance processor, a smart speaker using high-resolution audio recording and playback as well as the built-in full-digital amplifier, or a low-power time-lapse camera employing the camera interface. The board can make the IoT smarter and more efficient. The board offers Ultra-low power consumption, and Multiple GNSS systems are supported including GPS, GLONASS, SBAS, Galileo, and Beidu. The advanced high-resolution audio features 192kHz/24 bit high-resolution audio codec. The board also comprises 192kHz A/D converter, eight channel microphone inputs (for digital microphones), a full digital amplifier with BTL stereo output. The device offers extensive computing power with the Hexa-core ARM Cortex-M4F.